I am working on a project that will have a place to hold mail and then hooks to hang keys. I am not sure what would be the best way to hang it on the wall. I figure this will get bumped when adding/removing keys, etc so thinking that the method used with picture frames like these aren’t the best. 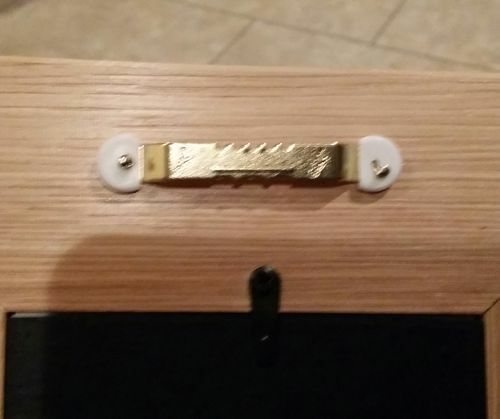 I looked at a wooden plaque we have had for years and looked like a slot was routed and it hangs firmly on a small nail. I’m leaning toward something like that but checking with LJ for other options. This is a “thank you” gift for someone who helped me out with something on my truck so not sure what the surface will be. That would be very secure. The board is about 12” long by 7” high so not too big. The keyhole looking cut is interesting- but not sure how to make that cut. Is there a name for that technique so I can look for a how to video? Edit #2…have one ordered. Thanks for the recommendation! 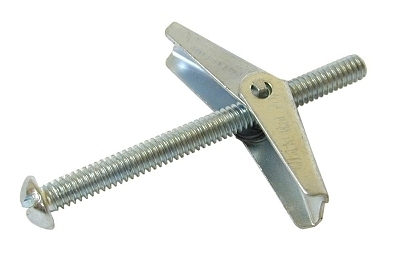 Just ordered a keyhole bit – guessing the bit will be nice to have for this and also future projects. Looking forward to trying it out. I’ve always likes the half lap method, when I’m not sure where it’s going to be hung. That way if the studs are off it doesn’t matter, unlike keyholes. Just mount your wall board level and hang the other on it. If you want you can run 1 or 2 screws thru the back into the mount board to keep it from lifting up & unhooking. Thanks for the suggestion. I’m not sure how this would be set up. I’ve used half lap on joints but can’t picture how this would be applied on the wall. Would it require drilling through the project piece to attach? I ve always likes the half lap method, when I m not sure where it s going to be hung. That way if the studs are off it doesn t matter, unlike keyholes. Just mount your wall board level and hang the other on it. If you want you can run 1 or 2 screws thru the back into the mount board to keep it from lifting up & unhooking. Board attached to the wall has a dado (half lap) cut on the side toward the wall. Mount piece has another opposite half lap piece mounted or cut into the frame of the piece to mount. Mount the wall board level, allowing room at the ceiling to let the piece go over the mount board and drop the half laps together. The system used to be used by a lot of cabinet installers. You mount your half lap mount boards level around the kitchen wall. The cabinets have the opposite lap cut into the top frame rail or a mount board. You hang the cabinets on the mount boards and run crown moulding or plate rail around the top to close the top gap. That way you don’t have to hold up the heavy cabinet up while someone screws them fast and you don’t have to worry if the studs line up with the cabinet case where you can’t run a screw. Ok -sounds like this would be a similar concept as using the cleat system. Can definitely see how this would be helpful in getting cabinents mounted. Thanks for clarifying. Adding this technique to my mental “how to” resource list. Board attached to the wall has a dado (half lap) cut on the side toward the wall. Mount piece has another opposite half lap piece mounted or cut into the frame of the piece to mount. Mount the wall board level, allowing room at the ceiling to let the piece go over the mount board and drop the half laps together. The system used to be used by a lot of cabinet installers. You mount your half lap mount boards level around the kitchen wall. The cabinets have the opposite lap cut into the top frame rail or a mount board. You hang the cabinets on the mount boards and run crown moulding or plate rail around the top to close the top gap. That way you don t have to hold up the heavy cabinet up while someone screws them fast and you don t have to worry if the studs line up with the cabinet case where you can t run a screw. Yeah, the keyhole idea looks like a winner. If you really want to go the extra mile, include a paper template for spacing the screws the correct distance apart. I’m assuming you’ll rout two slots, but I guess one could work as well. For other projects that don’t require that much stability, like picture frames, I’ve had good luck using the standard toothed hangers. I just add squares of double-sided tape at the lower corners, and they stay put. For large and heavy objects like mirror frames I screw them directly to the wall and cap the holes with decorative square plugs. I think you’re on the right track with the keyhole slots for this project. Thanks for the feedback. I’ve used the other methods as you mentioned with a picture frame and shelf but think the keyhole slot seems a good match for the project. Will play around with the bit when it arrives. I’m thinking of making the slot horizontal so the person can have an ability to adjust as needed (rather than my trying to ensure the hole is perfectly centered with a vertical slot). Yeah, the keyhole idea looks like a winner. If you really want to go the extra mile, include a paper template for spacing the screws the correct distance apart. I m assuming you ll rout two slots, but I guess one could work as well. For other projects that don t require that much stability, like picture frames, I ve had good luck using the standard toothed hangers. I just add squares of double-sided tape at the lower corners, and they stay put. I think you re on the right track with the keyhole slots for this project. The first picture with the “sawtooth” hanger is something I’ll never use. They have a tendency to never be exactly centered causing the frame to hang crooked. 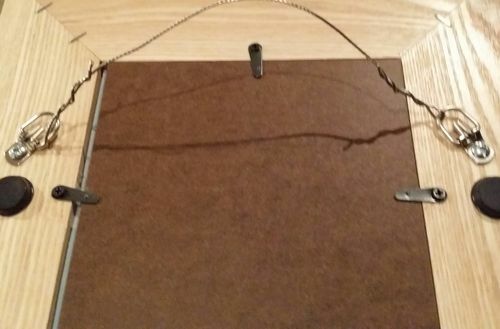 The wire works very well for frames that will not be touched, but you can center them easily (wider frames need two support screws into the wall, but adjustment are just as easy. For anything that is going to be “touched: you really should have two hanging points. The “D” rings (where the wire attaches to the frame in your picture) work well, I prefer the triangle shaped ones. Two screws with largish diameter heads into the wall and you can rotate the rings slightly if the screws are slightly mis-positioned. The keyhole slots are excellent, only issue is you need to have the screws in the wall located exactly. No room for error. If the object to hang is largish, you can use a straight bit to cut the keyhole slot and use metal keyhole cover plates that screw down over the slot. These avoid any problems of the wood breaking away. Keyholes are the more refined approach IMO.